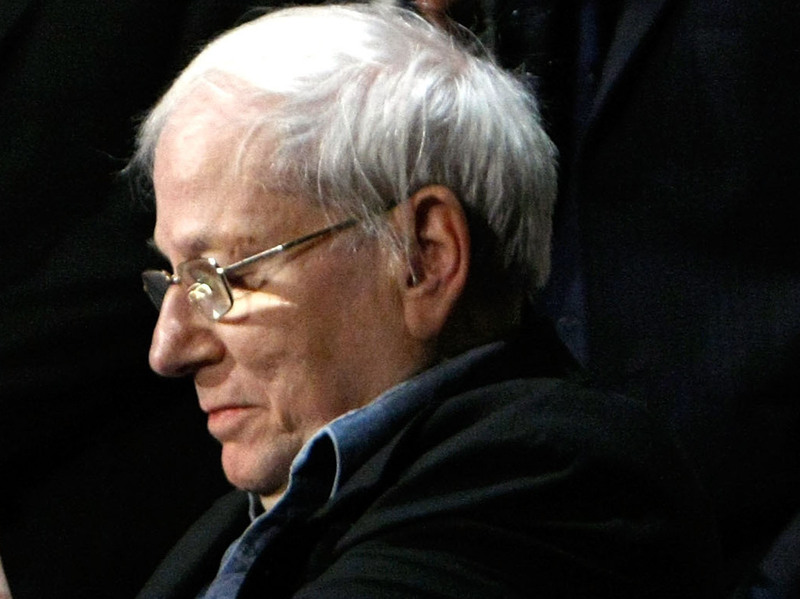 Israeli Writer Yoram Kaniuk, 83, On Pain And Peace Author and journalist Yoram Kaniuk died June 8 at age 83. He joined Fresh Air's Terry Gross in August 1988 to talk about fighting in the Israeli underground and his belief that, for Israelis and Palestinians, "the only way is to live somehow together." Yoram Kaniuk speaks in 2008 at the AFI Fest premiere of Adam Resurrected, based on a novel he wrote. Born in Israel in 1930, Yoram Kaniuk wrote novels and articles that explored war, the Holocaust, Israel, and the prospect of peace for Israelis and Palestinians. He was an outspoken proponent of the need for Israelis and Palestinians to understand that both groups of people deserve sovereignty. "Both sides are right, and both sides are so strong about the rightness," he told Fresh Air's Terry Gross in August 1988. He believed that arguing over "who suffered more" wasn't productive. "I don't measure pain versus pain or how much the Palestinians have [suffered] compared to the Holocaust survivors," he said. "That's not the point. The point is that, right now in the reality of Israel, the Jews are the sovereign people ... and the Arabs are living under that." Kaniuk died on June 8 at age 83. Yoram Kaniuk, a prominent Israeli writer who spoke out for peace with Palestinians and against religious extremism in Israel, died Saturday in Tel Aviv. He was 83. Kaniuk was born in Palestine in 1930, and was wounded in Israel's war for independence. Among his 30 books is "Adam Resurrected," set in a mental institution for Holocaust survivors, which was made into a film, starring Jeff Goldblum and Willem Dafoe. In recent years, Kaniuk became a cultural leader of secular Jews - winning a court decision allowing him to be legally classified as a Jew of no religion. Terry spoke to Yoram Kaniuk in 1988, after he and other Jewish and Palestinian intellectuals had signed their own peace treaty. His latest novel was called "Confessions of A Good Arab." It's about the son of a Jewish mother and Arab father who is disowned by both communities. Terry began by asking Kaniuk if writing the book was an exercise in trying to see Arabs and Jews from the perspective of one who is at once both and neither. YORAM KANIUK: Most of my characters I've written about were a little split, so I felt a need to get into that split personality or split nationality - from the force of the pains that inflict our society, the Israeli pain, our pain and since both sides are right and both sides are so strong about their rightness, I felt that I understand that as a person, as a human being. Part of the argument between Jews and Arabs in Israel is all the time who suffered more. Just like in a Jewish family, you know. Do you think that's a pretty fruitless way, a pointless way, of looking at conflict, the who suffered more syndrome? KANIUK: I think it's part of our conflict anyway, because it's a Jewish thing to be a victim because the Jews were victims and the Palestinians had inherited that quality or whatever. And it's very strong because the Jews like to still feel victims in Israel but they are not. They were victims until they came there. But the Palestinians are the victims of the situation. I don't measure pain versus pain or how much the Palestinians have it compared to the Holocaust survivors. That's not the point. The point of it right now, in the reality of Israel, the Jews are the sovereign people. I mean Israel is a sovereign - the Jewish sovereignty. And the Arabs are living under that. GROSS: The main character in your book makes a few observations about Israeli soldiers, and he describes the kind of person who is an outstanding soldier, protesting every injustice, but always doing what he was told in the end, searching his soul while he shot from the hip. Someone who defends the motherland and suffers pangs of conscience, loving his enemies but killing them with the most sophisticated means available. Is that really an observation of yours about a certain type of person in the Israeli army? KANIUK: No. It's an observation of a very large part of our, I would say, the more intelligentsia, and it includes me. I was like that when I was 18. It's a kind of a Jewish mutation(ph). We became Hebrews. We became sort of Russian Jews. And so many of us have strong pains. I mean it's like trying to be Marlon Brando and John Wayne at the same time. I mean fighting the Indians and moralize about it. KANIUK: I mean, but you had 300 years to have in between. We didn't. So there is some ironic things about this observation because it's a part of me that criticized the part of me that is probably the best part of me. Because we are fighting not for fun. I mean - and neither do the Palestinians. But we also - when we - when the Israeli soldiers went into Lebanon and it was not a very right war, according to me, of course, and they shut their eyes when the Christians were massacring in Sabra and Shatila, they also - the Israelis were also the ones who wrote the best and the most moving poems about it. A Palestinian writer once accused the Palestinians and said to them, look, these Jews, I mean first of all they kill you. Then they moralize about it. Then they write the best poems about it. In other words, why don't you at least write these poems? So I think that this is very much part of our collective psyche. GROSS: You've written about the split between the Israelis before World War II, the Jews who settled Israel before World War II and their ideals, and how that was changed after the Holocaust and after many Holocaust survivors came to Israel. Now, you were born in Israel in 1930, before the war. What brought your parents to Israel? KANIUK: Well, my mother was born in Russia but she came with her parents in the beginning of the century. They call them the second wave of immigration. It was very Zionistic and very idealistic. This generation was in fact the founders of modern Israel. And my father was born in Ukraine (unintelligible) he went to Berlin and studied in Heidelberg. And I don't know, in 1926 I never understood why he decided to come to Israel. It was always mysterious. And he was a founder of the Tel Aviv museum and he started chamber music in Israel, which became very big. But I think that they represent, both of them in a way, the immigration we had before, before even Hitler came to power, which was not very much but people who came for idealistic reasons. The feeling was that something beautiful and great and fantastic is going to happen and the Jews will all understand that the condition in Europe is going to be terrible and they're going to come. I mean when I was seven years old, in '37, we used to write letters to children in Germany saying, little Franz(ph), you know, you're going to die soon. Please come to Israel. Signed Yorum. And we really believed in it. And of course if they had listened, they would have been alive today. Yeah. GROSS: You fought in the war of independence. KANIUK: Yes. I fought in '48 and I was wounded in the battle of the Old City. Yeah. GROSS: ...how did you feel about fighting? KANIUK: I volunteered - when I was 17, in 1947, I joined the (unintelligible) the underground. KANIUK: And the fighting started around the beginning of December. And from there on I was fighting. First as parties and kind of fighting, and then more and more in - not yet army but army-like brigades and so on. GROSS: How did having to fight in a war change your sense of idealism? KANIUK: It makes you aware maybe of life in a different way. I saw my friends - not all, but many, many of my friends - being killed. And I saw a lot of atrocities. And I developed even then, when I was 18 in the war, a feeling that on one hand you can be an angry man and your stomach is full of anger, but you have to use your sanity in order to find a solution. And even in '48 they were laughing at me because I was talking about walking together with the Arabs and finding some solution. Even then I felt that the only way is to live somehow together. So I think that I'm saying that is because even then I could somehow conquer my deep Jewish anger that lingers in my stomach with a sanity that I thought needed for practical living. DAVIES: Israeli novelist Yoram Kaniuk speaking with Terry Gross in 1988. We'll hear more after a break. This is FRESH AIR. KANIUK: This is FRESH AIR and we're listening to Terry's 1988 interview with Israeli novelist Yoram Kaniuk, who died Saturday at the age of 83. GROSS: In the late '40s, in 1949, you were sent by the Israeli government to Europe to try to encourage Holocaust survivors to come to Israel to settle. KANIUK: No, no, no. That's a very wrong expression. No. KANIUK: Because what happened in country, I was not sent - I went there after the war. I was sent to work on a ship that - there were many ships like that looked all around Europe for survivors. No one wanted these Jews. People forget that in the late '40s, even after the war, there was no country in the world that really wanted these refugees. There were pogroms in Poland when they came back to their homes. So they were looking for some way out. And America then started to take some immigrants, after - they didn't take - you didn't take Jewish immigrants during the war. And some of them managed to go to America and Australia, but most of them had to come to Palestine, to Israel. But not because we had to convince them. They knew that the only place in the world that would take them is Israel. I mean these people were the greatest survivors in the history and they moved from place to place - from Poland to Russia, from Russia to Hungary, from Hungary to Yugoslavia. And in most places no one wanted them. They were unwanted even after the Holocaust, even after Auschwitz. People forget it today. So finally 250 or 300 thousand of these people came to Israel. And they changed the whole thing in Israel because before you had a homogeneous Jewish society, Hebrew society. It was an Arab society, of course. But then came these greatest survivors of history and they changed the whole country. They came with a different kind of pain and different kind of memory and different kind of mistrust. And our society was torn apart and became slowly what Israel is today. And all my books are about that split, this time when the Jew became an Israeli, the Israeli became a Jew. I mean we didn't feel before that we were Jews. We felt that we are something else, Hebrews. It was not simple because we were a very different breed of people. We grew up in Palestine in the heat, near the sea. We never lived in ghettos. And we were educating ourselves to work and to fight and to do all these kinds of things they didn't do in the diaspora in those days in Eastern Europe. GROSS: So you were personally changed after World War II when Holocaust survivors immigrated to Israel. KANIUK: I was born. I was reborn. I mean the whole thing was for me - when I walked on this ship, this was the greatest event of my life. This is when I was shaped. But all of a sudden I was with people that really went through hell, something that I never knew existed. And they kept telling me this and their face was showing it and you can feel it in them. And so slowly I became - I mean I even invented the whole biography of being them(ph), because I thought, god, if my father didn't come in '26 and I would be born in (unintelligible), then I'll disappear like my cousins who disappeared and no one knows where they are. It's this fear of many of us Israelis that we were there by accident because our parents decided to come there or someone else's parents decided to go to America and could. I mean most of the Jews that wanted to go to America of course couldn't get in. But for me, Israel existed. The important thing is because we need one place where Jews can always come. We knew the time when no country in the world - no Argentina, no Brazil, no Australia, not Canada, not America - no one wanted the Jews. And two million Jews died in vain because they could've been saved if one of these countries wanted them. GROSS: You obviously feel that it's important that you understand and describe to others the pain and suffering of the Jewish people, but you also think it's important that the Jewish people understand what the Palestinians have been through and that the Palestinians understand what the Jews have been through so you can reach some kind of understanding. KANIUK: I think so. I think that we have to (unintelligible) the kind of fears of each other, of myth that we build about each other, and look at the reality and say, look, we've been fighting each other. We've been hurting each other. And I think that part of it is not understanding that the Palestinians have a case. They became a nation only lately. We became a nation only lately. The Zionism and the Palestinian movements are both new to their histories. GROSS: Well, I thank you very much for talking with us. Thank you. KANIUK: Thank you very much. DAVIES: Yoram Kaniuk spoke to Terry in 1988. He died Saturday in Tel Aviv. He was 83. You can download podcasts of our show at freshair.npr.org. Follow us on Twitter at nprfreshair and on Tumblr at nprfreshair.tumblr.com.